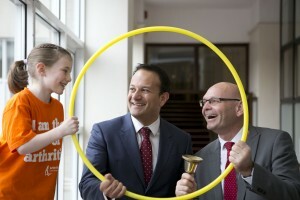 Fírinne ní Dhálaigh (aged 7), Minister for Health Leo Varadkar and John Church, CEO of Arthritis Ireland. Children are often the forgotten face of Arthritis with over a 1,000 children living with the condition in this country. Arthritis is often seen as an “old person’s disease” however, unfortunately it is also a chronic disease impacting on children and young people in Ireland with more and more cases appearing daily. A recent online survey conducted by Arthritis Ireland found that over 40% of children diagnosed with arthritis were under 3 years of age and 37% of parents said the most difficult thing about their child having arthritis is the feeling of helplessness and inability to take away their pain. Children with arthritis face daily challenges, which severely can impact their childhood, such as not being able to play outside in the school yard, brush their own teeth or even hold their mothers hand. Children with arthritis also have to learn to manage their pain with some having injections 1-2 times a week, infusions and fortnightly hospital visits. Organise a day of schoolyard games during the month of May in your workplace or community, games such as red rover, hopscotch, rounder’s, chasing, skipping, kick-ups and lots more. Register now at www.backtotheschoolyard.ie or call the fundraising team on (01) 6470205. 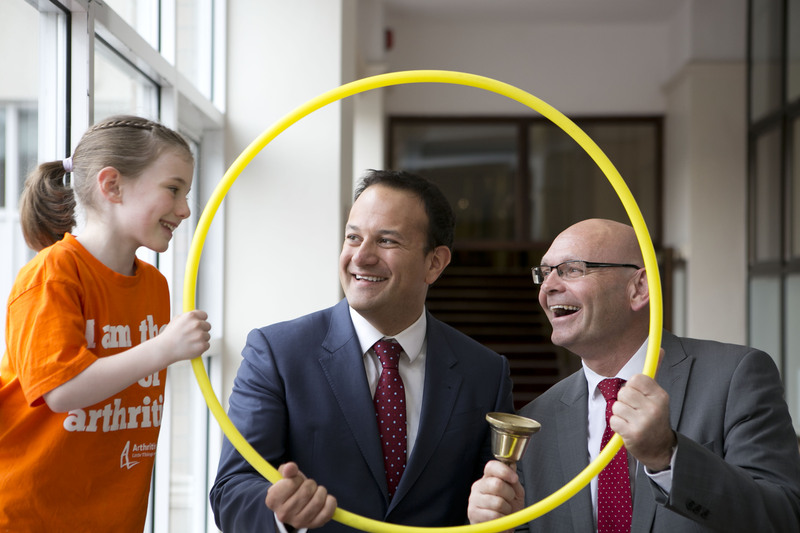 “Back To The School Yard” is part of a month-long campaign organised by Arthritis Ireland to raise funds and awareness for children living with Arthritis. Arthritis affects over a 1,000 children nationwide. There are over 7 different types of arthritis in children and these can affect children of all ages from babies and toddlers right through to those in their teenage years. Little things can make a big difference to a child with arthritis. Difficulty with the little things like holding their parents hand, getting dressed or playing with their friends can all add up to have a big impact on a child’s quality of life. At Arthritis Ireland, we understand this. That is why we are Ireland’s only organisation working single-mindedly to transform the experience of children living with arthritis and those who care for them. Every day, we work in communities across the country providing family-based education programmes to help parents and their children effectively manage and control this devastating disease. We actively drive grassroots advocacy so that the voice of people with arthritis is heard and understood and we work with the medical community to control and cure arthritis.